An individual’s learning is determined by cognition, motivation, and social context. Taking these aspects into account, we assessed scaffolding in tutoring situations via contingency to determine how successful and unsuccessful teacher–student interactions are shaped. We aimed to find out how the problem-solving process in successful tutoring situations differs from that in unsuccessful tutoring situations with regard to cognition, motivation and increasing task complexity. Therefore, using a qualitatively oriented multi-method approach, we analyzed 26 tutoring situations involving an algebraic word problem in middle schools. Specifically, we analyzed, first, the tutee’s independent performance in a transfer task, and second, the tutee’s active participation, the activation of participation by the tutor, the impact of errors and the motivational support by the tutor in the tutoring situation. Connecting the results, we composed process graphs and narrative descriptions which revealed three types of successful and three types of unsuccessful teacher–student interaction, depending on the level of the tutee’s participation and uncovered cognitive activity (i.e., reactive, collaborative, self-responsible). In successful tutoring situations, the graphs showed high levels of cognitive and motivational support with increasing task complexity. However, in the type reactive participation, motivational support was low. Thus, contingent support should be adapted to the learner’s current understanding and task complexity, and motivational support should be administered plausibly for the learner. With this research, we offer a tool to assess contingency regarding cognitive and motivational support in a task-solving process. The results are discussed in relation to the Interactive–Constructive-Active–Passive framework and Cognitive Load Theory. We appreciate the thoughtful comments from the anonymous reviewers. We would like to thank Dorothea Baumgartner for assisting as a second coder and Sarah Mannion for proof-reading. The work was funded by the Swiss National Science Foundation, Grant Number 100013-113971/1. The study was conducted in accordance with the German Psychological Society (DGPs) ethical guidelines (2004, CIII) as well as APA ethical standards. According to the German Psychological Society’s ethical commission, approval from an institutional research board only needs to be obtained, if funding is subject to ethical approval by an Institutional Review Board. This research was reviewed and approved by the Swiss National Science Foundation (SNF), which did not require additional Institutional Review Board approval. Aelterman, N., Vansteenkiste, M., Haerens, L., Soenens, B., Fontaine, J. R., & Reeve, J. (2018). 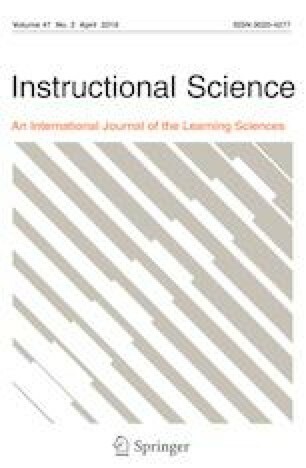 Toward an integrative and fine-grained insight in motivating and demotivating teaching styles: The merits of a circumplex approach. Journal of Educational Psychology. https://doi.org/10.1037/edu0000293. Shavelson, R. J. (2006). On the integration of formative assessment in teaching and learning with implications for teacher education. Stanford Education Assessment Laboratory and the University of Hawaii Curriculum Research and Development Group. Retrieved from 27, 2011, http://www.stanford.edu/dept/SUSE/SEAL/Reports_Papers/Paper.htm.